The region of Puglia, located in the heel of Italy's boot, is known for the importance of its local cuisine. Known as Apulia in Italy, the region is well known for - and very proud of - its cucina povera (literally translated to 'food of the poor'), which is often crafted from juicy aubergine, tomatoes and olives, and the area's egg-free handmade pasta. 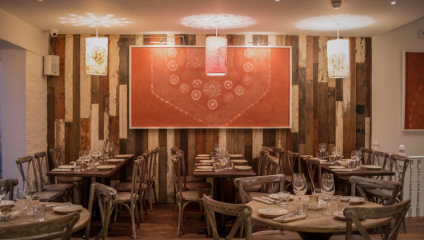 Terra Rossa is a little Upper Street restaurant that wants to bring a little pocket of Puglia to North London. The burrata comes with fresh peppers, which balance well with the cheese. Though the burrata itself might have done with a touch more seasoning, it tastes fresh with gorgeously thick cream and stretchy stracciatella. The fave e cicorie comes recommended for a hearty and very traditional starter: a warm, thick broad bean paste, almost the consistency and appearance of mashed potato but much more flavoursome and perfect for spreading on the toast provided, which contrasts nicely with with the juicy wilted chicory. Of course, an Italian restaurant wouldn’t be much cop if their pasta and pizza didn’t live up to expectations. Luckily, Terra Rossa wins big points in both categories. In fact, their delightful octopus ragù would likely win the golden ribbon. Even for those who might be wary of octopus, this will be a treat, bringing just the right amount of texture and zing to the paccheri pasta, though the dish remains remarkably rich and meaty, and the thick, wide tubes of pasta envelop the sauce perfectly, meaning you get the perfect mouthful. This is certainly a standout on the menu, and though in Italy pasta is traditionally a first course, these plates are certainly filling enough to be ordered as a main. Their pizza isn’t as wafer-thin as you might expect from such a determinedly traditional spot, but has a juicy crust (my hot tip: perfect for dipping in what’s left of your octopus ragù…) and we could certainly taste the difference of quality ingredients in our Cicoriella, with heriatge yellow tomatoes, chicory and celline olives. The combinations of flavours on the menu aren't your standard either, though you'll recognise a capricciosa and a diavola among the mix. To polish you off, there are a good spread of desserts on offer. We plumped for one pistachio ice cream (difficult to get right, but certainly done well here) and a wonderfully aesthetic millefeuille (or millefoglie if we're being properly Italian) dressed up like a knickerbocker glory, with fresh strawberries and dollops on dollops of cream. Service was warm and friendly, and the staff were clearly knowledgeable in their recommendations. 'Italian' restaurants abound in London, but this really is the real thing: it's all about real food, and coming together through it. Buon appetito!